I honestly don’t do much reading myself, but books with epic covers tend to entice me. Or rather, they catch my wife’s eye and she buys them for me. And then I have to read them! 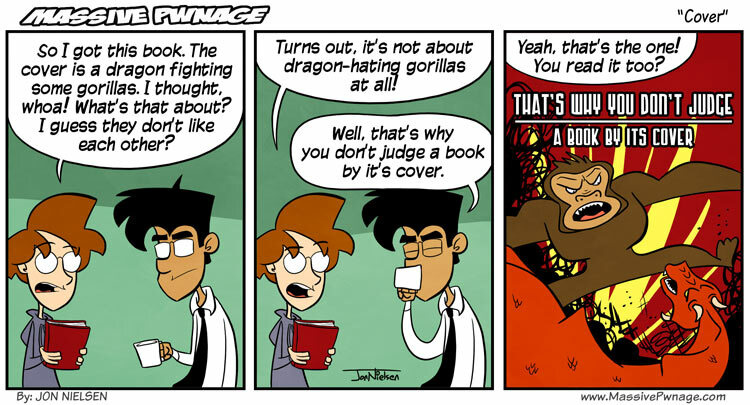 This entry was posted on Wednesday, August 10th, 2011 at 12:00 am and is filed under Comics. You can follow any responses to this entry through the RSS 2.0 feed. Both comments and pings are currently closed. So instead of fighting, they missed each other and was running into each other’s arms to hug, right? Dude, you really gotta learn how to spell “its”! When used as a contraction of the words “it” and “is” you use an apostrophe. When you use the possessive version, you leave it out. The cover of what was referred to earlier. lol this looks like something I would do. Pick a book based on the cover, that’s probably why I read Pride and Prejudice and Zombies… On a side note, you’re married Ence? ?